Get out your hacky-sack balls, kids! The Phish are flying again. That's right, the legendary jam band have made it official: they are reuniting in 2009, with three shows already lined up for next March. Phish will perform at the Hampton Coliseum in Hampton, Virginia, on March 6, 7 and 8 of 2009. The group plans to announce additional dates early next year. Known to Phish fans as "The Mothership," the Hampton Coliseum has long been one of the group's favorite venues. The jam band recorded the Grammy-nominated six-CD set, Hampton Comes Alive, at the venue 10 years ago. 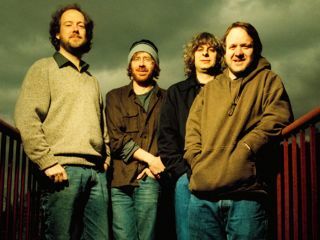 The reunion announcement comes as a pleasant shock to many fans, given that frontman Trey Anastasio has been most vocal in his comments that he didn't want Phish to become a caricature, or a nostalgia act. The band last performed together officially in August 2004 (although they did an an impromtu jam at a friend's wedding last month). A small supply of tickets will be available directly through the band's ticketing system, with the request period ending Oct. 8. Tickets go on sale to the general public Oct. 18 through Ticketmaster. And get this: Face value for each ticket is just $49.50, which means you can actually afford gas to get to the show.